Engineering's Yan Yao will work with a team of researchers to produce a low-cost, safe and efficient sodium battery. A University of Houston engineer will lead development of a key component for a new, all solid-state sodium battery with the potential to revolutionize the nation’s electric grid. 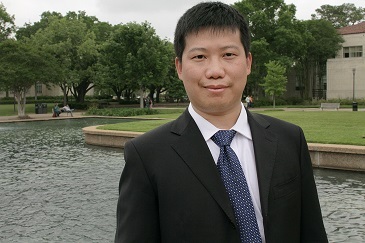 Yan Yao, assistant professor of electrical and computer engineering at UH, will work with a team of researchers and battery company Solid Power to produce a low-cost, safe and efficient sodium battery for grid-scale energy storage and other applications. The project is supported by $2.9 million in funding from the Department of Energy’s Advanced Research Projects Agency-Energy (ARPA-E). Yao, who also is a principal investigator for the Texas Center for Superconductivity at UH, said there are three reasons for the work. While conventional lithium-ion batteries have proven effective at storing energy on a limited scale, the liquid electrolyte in the batteries is flammable; a solid-state sodium battery would be much safer, he said, as well as less expensive and able to store greater amounts of energy. Yao, whose research group focuses on green and sustainable organic materials for energy generation and storage, will create a new battery cathode, the terminal from which electrical current leaves the battery. Other researchers include principal investigator Steve W. Martin at Iowa State University; Sehee Lee at the University of Colorado-Boulder; Scott Beckman and Soumik Banerjee at Washington State University, and Josh Buettner-Garrett at Solid Power. Existing sodium-sulfur batteries for grid energy storage operate at temperatures between 300 and 350 degrees Celsius, using molten sodium and sulfur separated by a solid electrolyte membrane; Yao said those have safety and durability concerns, as well as high production costs. The battery proposed by the researchers would operate near room temperature and, with an all solid-state design, would be more robust, scalable to manufacture and composed entirely of recyclable and renewable materials. The project is one of 41 cutting-edge energy technologies funded in a $125 million ARPA-E initiative, OPEN 2015. ARPA-E funds innovative technologies that display promise for both technical and commercial impact, but are too early for private-sector investment. The ARPA-E announcement noted the climate change talks in Paris and global efforts to lower carbon emissions. Large-scale energy storage is considered key to broader adoption of both solar and wind energy, allowing energy generated during sunny and windy periods to be stored for use at a future time. But Yao said any storage system will have to avoid several hurdles: It must be inexpensive to produce, have high energy density and avoid the flammability and other safety issues inherent in many batteries. Sodium is a soft, highly reactive metal, widely available across the world, he said.